Always a treat to show a Lichty! Rich and soulful. Excuisite in build but made for musicians to use and love. Those that desire the connection and inspiration you can experience with acoustics of the highest caliber. I truly beleive that There is no “best”!. Great instruments excel and inspire in different ways. Variety is the spice of life and I could sure enjoy this one. Hope to show you another soon. This custom baritone has the most gorgeous tone. Really responsive, yet warm. It feels SO good to play all along the neck. Most notable is the sound, as great (Or better!) than any baritone I can ever remember. If you want the ultimate bari, this is rare and special….this is another level of amazing…tone connoisseurs will be in heaven. 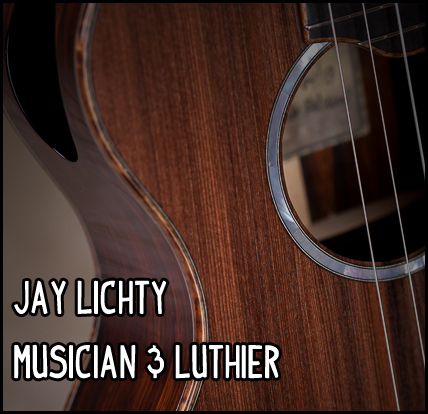 Lichty is an east coast luthier making high end ukes that are among the finest you will find. This baritone has a tight waist for a focused tone. It really looks beautiful, Sinker Redwood and Cocobolo are very expensive woods and framed off with koa binding it is all you could ask for. But regardless, it’s the quality of sound that this gives. That’s what justifies this price tag. Please share any thoughts or experiences.